The Himalaya and adjacent regions (Pan-Himalaya) form a natural phytogeographical unit, from the Vakhan Corridor eastwards to the Hengduan Mountains via the Karakorum and the Himalaya. This region covers the northeastern corner of Afghanistan, northern Pakistan, northern India, Nepal, Bhutan, northern Myanmar, and southwestern China. It is has the most diverse topography and landscape in the world and covers three of the 34 biodiversity hotspots in the world, where a rough estimate of 20,000 species of vascular plants can be found. 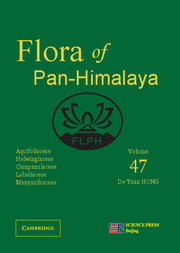 The Flora of Pan-Himalaya (FLPH) will be published in English in 50 volumes with around 80 books, with the larger families divided into two to seven parts. It will be the culmination of a decade or of international effort involving hundreds of scientists under the direction of Hong de Yuan, in collecting and identifying plants, many of which were previously unknown, of the whole Himalaya region. The series will constitute an indispensable resource for all those involved in plant conservation, biodiversity and taxonomy.